With Unity, you can save a lot of time by creating some tools adapted to your specific needs. Right above, a small path editor I made to save me some time when creating enemy patterns in my current project, Red Skies. With just a few click, I quickly design the general shape I want, then I can perfect it using the transform coordinates. The Unity editor offers a LOT of tools to make yours, but I will just cover some basics in this post, then it will be up to you to look at the APIs to discover hidden gems. WARNING: This post is ALL about code, with (commented) snippets rather than theory; that’s the way I like to learn, I hope I’m not alone! The most common tool you can use to make your life easier is custom inspector. And then you can go pretty crazy with the custom inspectors themselves. Those scripts are editor-side only (they have to inherit from Editor and be placed in a folder called Editor) and let you write what you want, how you want, in the inspector when an instance of your script is selected. There is a ton of functions to experiment with, that can be found in various editor classes such as EditorGUILayout, GUILayout, EditorGUIUtility and many others, ranging from simple to highly customizable. bool choosingNewId = false; //Are options displayed? Note that I could have used a PopUp to display the choices in another way (there are many other solutions, I guess, but the EditorGUILayout.PopUp is pretty neat). You just indicate the class for which you want to make your custom inspector, then the OnInspectorGUI is ready to make all your dreams come true. The EditorGUILayout and GUILayout classes are usually the more convenient to use, since you don’t have to handle the position and size of your elements, but you can use EditorGUI and GUI as well for very precise display (you could recreate, say, a color picker in the inspector by drawing a bunch of colored pixels and using the events of the mouse). There are of course some limitations and tricky cases, but it’s up to you to find out about those according to your needs. // the last line being only black squares. Of course there must be some more convenient and/or efficient ways of doing that (like using the default color picker from Unity – random example), but you can see that there is virtually no limit to what you can do, it’s more a matter of time and perseverance. However we won’t go very far with this window, in term of utility… Let’s say we want to change that, and have a DiscreteColor struct that can be tweaked from the inspector like a standard color. For that, we will use a Property Drawer to customize the field shown in the inspector. // By default it’s clear, so set its alpha to 1, since we don’t use alpha. // a crash… so don’t use it in your commercial production, maybe. You can as well build entire systems for game settings, accessible from menus, that parse assets in your project, save data to txt or asset files, modify prefabs… You can have access to or even set the selected object in the project tab, find all subclasses of a given class to create assets from scratch, open, modify and save scenes… You’ve got it: it’s powerful. That’s all! As said at the beginning of the post, this was just a very light overview of the possibilities offered by Unity’s editor, but the doc is quite nice, and there are tons of questions and answers on the webz about this subject. All the examples given here are small scripts, but you can build mad interfaces with all the options your game designers have always dreamed of without thinking it could come true someday. It will save you a crazy amount of time! For more articles, you can follow me on Twitter, Facebook or subscribe to this blog. In this technical post, I’m gonna talk about optimization, and specifically about memory allocations in Unity. Disclaimer: I’m in no way an expert in this area, and you should take anything from this article with caution, as it may not be perfectly accurate, or there may be better solutions than the ones I give. Let’s say it’s a basic overview of tips about reducing allocations. Second disclaimer: Some methods are here to reduce allocations, but it sometimes goes against speed performances (reasonably). Just choose what you’re looking for; it is for example more important on a mobile app than on a desktop game. Working on my mobile game, I didn’t care too much about performances or allocations (I usually try to write clear, flexible, readable code without doing premature optimization) until I faced issues on device. I began with some obvious fixes, like packing sprites to improve compression, which made the game a lot more playable. Still, there were frequent micro-freezes that were almost not noticeable at first, but became unbearable as soon as I took note of them. After some digging and playing around in the profiler, I found out those were due to some line named GC.Collect. I knew what garbage collection is, but didn’t really think about it until now, since it had never been an issue since I learned about it in school. In my project, it can take up to 8.62ms (on my high-end pc), leading to 9.79ms needed for my behaviours updates on a given frame; I didn’t check on device, but it was enough to be seen. From Unity doc: “When an object, string or array is created, the memory required to store it is allocated from a central pool called the heap.” And the GC.Collect, which can happen anytime, as soon as the heap requires it, empties this memory by collecting garbage, looking through all the objects to see if they are in use or not. This operation can take quite a long time if there are many objects, dead or still alive. Since I use pooling for almost everything in my game, I couldn’t really imagine where those alloc came from (the place it shows up in the profiler isn’t necessarily related to what really caused it). So I began investigating about this on the interwebz, and here are some tips on mistakes to avoid and methods to track them. The first obvious thing to say is: don’t create “new” things once your game is initialized/your scene is loaded. For your prefabs and even for components, use pooling and immediately instantiate everything you may need later. It also applies to arrays, list and dictionary, for example in an Update function where you have to fill an array every frame. Create one when the class starts, giving it the expected size as parameter, then clear it when you need it empty, instead of recreating it. It will keep its allocated space, and you can fill it again without extra allocation. Those are often very small allocs, but if they keep happening every frame, they will eventually cost more than the bigger ones that happen less frequently. If you have a method filling an array or a list, pass it as an argument of the function instead of making it its return value. Have your collection be a member of the class, initialized only once, then simply cleared and filled inside your method, so you don’t have to instantiate a new one every time. The strings create garbage as well, even when you concatenate them, so if you have to handle a lot of text somewhere and manipulate it heavily, use a StringBuilder that will take care of those memory issues alone and avoid the creation of garbage. In the same spirit, cache everything you need to check frequently. If GetComponent is supposed to only allocate memory in the editor and not on device, other functions like GetComponentsInChildren will never be good to use on a regular basis (which is obvious since it returns an array). So call it once if you need it, then keep the result to reuse it and update it if needed. Another well-known garbage creator is the foreach. Because of Boxing (I’ll let you look for it if you want to go in detail), a foreach loop used on a collection containing objects creates garbage, so just use a simple for loop. Some basic methods or functionalities provided by Unity also generate garbage for weird reasons. The best way to track them is to use the profiler after encapsulating your code in Profiler.BeginSample(“SampleName”) / Profiler.EndSample(). Those sections will have their own line in the profiler, allowing you to find exactly what line generates garbage and finding those tricky allocs. Vector3.Equals, for example, generates garbage; just compare the coordinates of your vectors one by one. Also, don’t use enum values as dictionary keys, cast them to int. There must be several other tips of this kind which I did not have to deal with, so be sure to profile until you find the very line making the alloc. Finally, you can trigger the garbage collector by yourself by calling System.GC.Collect(). I naively tried to call it every 30 frames, so that the garbage don’t have the time to grow, but the thing is that garbage collection duration will take as much time whether it has a lot to clear or not, because it scales with the total amount of objects. The best thing to do (besides not allocating anything) is to call this at the right time: just before starting the gameplay, when the player pauses the game, during loading of cutscenes… In those occasions, the collection spike will be invisible to the player (but your code still has to be clean enough so that it doesn’t need to be called outside of those circumstances). Sadly, some of Unity’s methods generating garbage can’t really be avoided without doing some programming weird tricks. I couldn’t find anything about some obvious “leaks”, like Text.OnEnable or OnGUI functions, which can generate quite a lot of garbage if you use them frequently. Changing game state, reenabling the HUD… That hurts. In those cases, if you don’t want to recode yourself the whole system, you’ll have to be smart about the way you call them. Maybe you could just put that label offscreen when it’s not used, instead of disabling it? Rather than calling Clear/Stop on your particle system when it’s not used anymore, store its end date when starting it (don’t check each frame if it’s still alive! ), and if it went until the end when you don’t need it anymore, don’t bother clearing it. There are a bunch of other methods from Unity that allocate memory on the heap, some of which you can bypass, some of which you’ll just have to deal with. Just remember that it’s not always essential to reach 0 alloc; if a function called once in a while generates some KB of garbage, maybe it’s ok, as long as it’s not every frame. Optimize wisely. On the rendering side, there is a lot to do. Pack your sprites in atlases, use an uniform scale on all of them in game, don’t modify the shared material of only one instance. In my project for example, I used an additive shader to make the enemies blink in white when hit, but every time I did that, a new instance of the material was spawned, and the enemies couldn’t be correctly batched anymore. Instead, I added a white sprite of the hit enemy, and just enable/disable it when needed (which fortunately doesn’t have the same memory impact as UI.Text). On the physics side, it can often be easy to optimize things as well, if you started with a naive approach. Check your collisions matrix, remove all unnecessary cases. Try to use less colliders if you have several of them on some objects, prefer circle/sphere colliders to square/box or capsule ones. 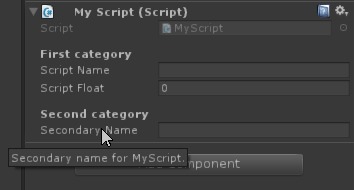 If you use Unity’s UI system, disable the “UI Raycast Target” option (checked by default) on everything that doesn’t need it. Don’t leave empty Unity callbacks, especially like Update or FixedUpdate: because of the way they are called, it can be costly if you have a lot of behaviours, even if there is no code in them. Well, that’s all for today. Please get in touch if you see mistakes or inaccurate advices so I can fix it before more people read it! If you liked it and want more, don’t hesitate to subscribe to this blog, or follow me on Twitter: @Grhyll.